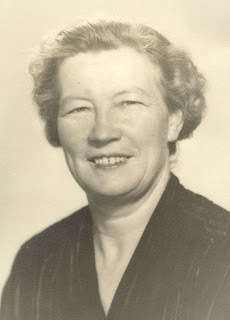 Myrtle Greer, shown here in the late 1940s about the time she received the signature quilt, was involved with neighbors as well as church members. Mary Donnell and Ada Dolittle were two neighbors who signed the quilt in addition to Patsy Ward (already mentioned) who lived across the street. We know little about Mary and Ada, but hope to learn more as resources become available. We know more about Mae Lenox who lived in a tiny house next door to the Greer’s little house on North Harrison Avenue. She was almost 20 years older than Myrtle, making her 71 in 1949. Her husband Fred had been a streetcar operator, and they lived a simple life. They moved to Harrison in the 1930s. At one time, when they lived on Woodlawn Avenue, Mae had taken in boarders to make ends meet. She had been married before and had one son, Edward, born about 1898, but he was grown and moved away. 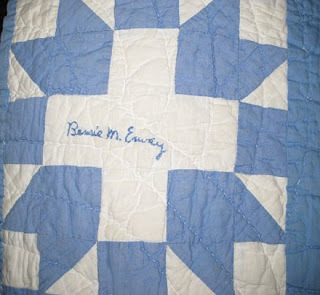 Two of the 24 women who signed the quilt were Louise Greer’s art teachers, Bessie M. Erway and Nina Head. In 1937 when Louise was about 13, Jim and Myrtle Greer arranged for her to take oil painting lessons from Mrs. Erway, a talented artist from Red Cloud, Nebraska. From Fitly Framed Together, Louise reminisces about this experience: “I would go to her house on Montgomery road every Saturday afternoon. Most of my old pictures are ones that I did when she was teaching me. “Because of the Depression, Mrs. Erway could not make a living selling her paintings, and she worked for years for a company in Chicago making fur coats, sewing the pelts together by hand. It was such hard work that it ruined her hands and caused them to shake most of the time. When she wanted to show me a painting technique, she had to steady one hand with the other. “I enjoyed Mrs. Erway. She would take me into Chicago to deliver the fur coats. We would ride on the “L” [elevated train] to places like Chinatown. Then we would eat somewhere and buy a treat. It was usually coconut cream pie. One time I didn’t go with her, and she brought me home a coconut cream pie!" 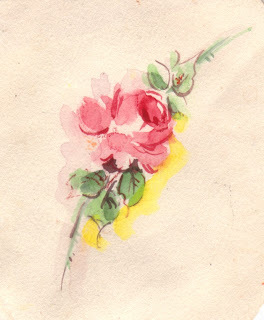 Louise, who is known for her watercolor roses, tells how she learned to paint them: “I don’t remember when I started taking art lessons from Miss Nina Head. She taught art at Aurora College and supplemented her income by giving art lessons. She had turned her dining room into a studio. She would set easels up in there and, when the lessons were over, the students helped put the easels back in a closet. There would be four or five people in a class. “I paid for the art lessons by helping clean her house. One of her legs was stiff from having had polio as a child, and she had a hard time walking. She would make a little lunch while I mopped the kitchen floor and vacuumed and did other things to help her….